When most people think of taxes, they think about their obligations — what they have to pay and the fines and penalties they will face if they don’t. Most people don’t think about their rights, and some people don’t even know that they have rights. Here’s what the Arizona Taxpayer’s Bill of Rights provides! In fact, the IRS has created a Taxpayer Bill of Rights to educate people about those rights. The Bill was established in 2014, but few people know about it. If you have been notified that you are the subject of an audit or some other action by the IRS, you should contact an Arizona tax attorney as soon as possible to discuss your options and learn about your rights. You have the right to know about the law and your rights within it. Those laws can be quite complicated, so you can work with a tax attorney to better understand them. You also have the right to be informed about the charges being made against you, whether it’s something simple like making a mistake on your tax return or something more serious like tax fraud. This information should be supplied when the IRS contacts you, and you should be able to get additional details upon request. You do not have to put up with rude service or with agents who give you the run around or fail to return your calls or letters. The IRS has stipulated that you have the right to quality service, and that includes friendly and professional treatment. Agents should also respond to your communications in a timely manner. If you experience poor service, you can report the agents. This one seems like a no brainer, but there can be great room for interpretation in what is the “correct amount of tax.” That’s why it’s so important to work with an Arizona tax attorney or another tax professional. Your lawyer can make the case for the tax that you and your tax professional both believe is the true amount you should pay. The IRS does not have the final word — even though it may feel that way sometimes. You can challenge any judgment that the IRS makes about your tax obligations, even after a judge has ruled against you. An experienced tax attorney can help you understand your options and prepare your challenge to improve your chances of success. You might feel like the system is rigged if you are appealing to the organization who ruled against you for a new decision. Therefore, you have the right to file your appeal in an independent forum, such as a federal court. The options will vary depending on where you are in the process of challenging a decision. Just like in the judicial system, a tax case against you cannot go on and on. You have the right to get a final judgment and to put it behind you once and for all. The IRS can’t open up a closed case against you unless new evidence is found of your tax obligation, and the year is not closed. Of course, you can appeal a case even if a judgment has been rendered. You don’t have to worry that the details of your tax debts will be splashed all over the evening news or that the IRS will be showing up to your work to question your co-workers (unless you own a business and it is being audited, of course). The IRS agent will contact you discreetly and will typically handle any audit or other tax matter through phone calls or written correspondence. Field audits where an agent shows up to your home are rare. Your nosy neighbor can’t call the IRS and ask for details about your taxes. Your tax returns and any IRS actions against you are your business and your business alone. No one else has a right to this information, unless by rule of a judge in a legal matter. Just like in a criminal proceeding, you have the right to an attorney in a tax case. Your tax attorney will help you understand your rights and the complex legal issues that are involved in your case. You can hire an attorney at any stage, including from the initial notice of a discrepancy on your tax return. Even if you don’t need representation in court, your attorney can give you advice on how to handle these and other tax matters. All taxpayers have the right to a fair and just tax system, and this bill of rights was established as part of an effort to ensure the system is fair just. The laws are designed to codify your responsibilities, as well as your rights. The system isn’t just designed to take your money, but to ensure that you pay what has been established as your duty by law. Your taxpayer rights are not as well known as your rights related to criminal matters, but it worth getting to know them better. You never know when you might open up your mailbox and find that you are the subject of an IRS audit. 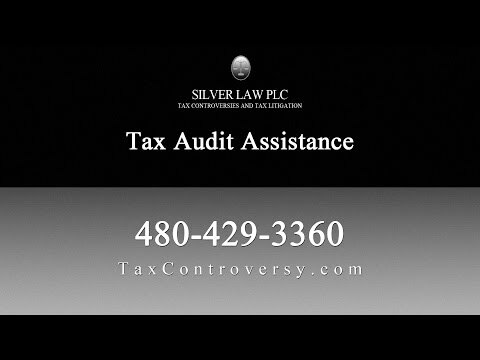 If you ever do receive such a notice, Silver Law PLC in Scottsdale, Arizona is ready to help you. We represent clients involved in tax audits, tax litigation and collections. We also help clients seek innocent spouse relief, or we can help businesses with their foreign tax reporting obligations. We will create a strong case to help you minimize your tax obligation and any associated fines or penalties. Contact us to schedule a consultation.